Upgrading abilities requires “ability materials”, of which there are three types: Tier I (green triangle), Tier II (blue square) and Tier III (purple pentagon). Geez, it’s like a box of Lucky Charms in here! The first two upgrades (to level 3) require only triangles and squares, which are relatively easy to get (and at high levels you will have hundreds of spares of). Anything above level 3 on an ability, though, requires those purple guys, and they are much harder to get. You have to save them and use them wisely. Note that you often have to scroll down to see the requirement for the purple hexagons but it is there for everything above level 3. Only do upgrades on characters you are sure you are going to keep, and save the materials for upgrades that have a big impact. For example, Count Dooku’s lightning attack: level 4 gives +5% damage, which is nice, but isn’t going to turn a battle. But at level 5 his chance of a secondary stun on this attack increases by 15%. That’s even better than it sounds because it is an increase in the base rate, which goes from 25% to 40%, so it’s actually 60% more likely (40/25 = 1.6). That is a worthwhile upgrade, even if you have to take a relatively useless +5% at level 4 to get it. Just watch your material counts. Game makers want you to log in every day, to keep you involved and active. It pads their stats and makes it more likely you will recommend the game and spend money on it. They therefore provide incentives: in SWGoH these include a daily freebie based on the day of month, several free bronzium cards, and “daily activities” that provide nice rewards for minimal effort. It generally takes less than an hour to do most of these dailies if you are in a hurry. If you don’t even have that, at least log in for the freebies and to use up your accumulated energy. This is linked to the previous item. Again, these are quick and provide decent rewards. They are also the only way to get XP for level advancement that doesn’t use energy. Do as many as possible every day. Remember that to get the reward for PvP arena you only need do 3 fights, not win them. Hard missions drop character shards; normal ones don’t. This is gated by you only being allowed to do 3 of any hard mission per day without having to spend crystals. Make sure that you do these for whichever characters you are working on. This mode opens up at level 40 and is an excellent source of important rewards. There are several good characters you can get in shipments there, and you can also get ability materials, training droids and bonus character shards. GW is also the best source of credits in the game. This mode matches you up against 12 opponent teams in a row. It can be very frustrating, especially for a new player. Remember that you can retreat and try different teams if one of your characters dies. Expect that you will not be able to complete it every day, or even at all, when you start. Don’t be deterred, just keep doing as much as you can. You’ll get better, and every reward helps. There are two types of energy, regular and Cantina, and they are required to run missions to get shards, gear, and importantly, XP. This game is not one where your energy completely refills at a particular time, it just slowly accumulates: 10 regular energy and 5 Cantina energy per hour. Make sure your regular energy is empty before you go to bed, because if it fills up to your maximum, you won’t get any more. At lower levels it will max out, don’t lose sleep over this, as the maximum increases by 1 every time you level. Be sure to spend bonus energy from level-ups quickly, so you are always accumulating more. There’s something about competition with other people that seems to get everyone’s juices flowing, and so a lot of people get obsessed with this game mode. For newcomers, though, this is usually a mistake. By the way, remember that this isn’t “real” PvP – you are fighting other player teams but the computer is controlling them. One very smart thing about this game is that PvP is segmented into leaderboards based on when you start, so new players have a chance to be competitive. That said, very quickly the top ranks will become dominated by the players who spend the most money. That’s just how it goes with freemium: you can buy your way to the top. Arena tokens: Quickly go up until you hit rank 200, then slow down a lot. For example, finishing at #200 gives you 700 tokens, finishing at #11 gives you 775. Not much difference. Credits: Basically the same. #1 gets 50k, #50 gets 25k. It’s a small amount regardless, though a nice bonus. Crystals: The reverse of arena tokens: slow progression until the very top echelons. The difference between #51 and #200 is only 25 crystals. The difference between #6 and #1 is 250 crystals. Everyone gets all worked up over the crystals, and sure, if you can finish in the #1 spot and get 500 crystals, that will certainly help you advance in the game. But the most important reward here is the arena tokens: 400 tokens equals 5 character shards from Arena shipments. Sure, the #1 guy gets 1000 tokens and you only get 700 tokens at #200. But you also get 100 for free from dailies, so even at #200 you are getting 10 character shards per day. This is what matters most, and it’s not hard to get. Even if you are only rank 500, that’s still 700 tokens per day, which is almost 10 shards per day. Bottom line: you don’t need to be very high rank in PvP to get good rewards. Don’t sweat it if you can’t get very far up the leaderboard, especially at the start. Also bear in mind that at the very top the competition gets fierce and you have to be prepared to “snipe” right before 6 pm to keep your rank. Many people find this impossible to do because of real life obligations, or just don’t think it’s worth it. I usually try to get into the top 20, but don’t much care beyond that, it’s just not worth worrying about to me. Sometimes I just sit in the top 50. It’s not worth losing sleep over. If you are a big spender, buy whatever suits your fancy. If you are on a budget, your best uses for crystals are generally going to be for two regular energy refreshes (50 crystals each) and one Cantina energy refresh (100 crystals). After that things get increasingly expensive. You get a certain number of crystals for free even if you don’t buy any, so use them on refreshes. If you get the crystal subscription you can do this even if your PvP rank is very low. If you are buying lots of crystals, feel free to go up the next rank to 100 crystal regular refreshes and 200 crystal Cantina refreshes. After that it gets very expensive very fast. Remember that in Cantina you can get shards both from the missions and shipments, so while twice as expensive you get more for your crystal. (Some of the best chars are also in Cantina shipments.) But you get more XP by doing a larger number of regular refreshes, so you level faster. Tradeoff. I will catch flak for this, but I think this is a waste unless you are a big spender. I have never purchased credit packs or droids, ever. Get good at Galactic War, do challenges and missions, and pace yourself, and you shouldn’t run out of credits except temporarily as you get to the upper levels. Droids I never come close to running out of. Be patient and save the crystals for more worthwhile uses, again, unless you are a big spender and just want to level things up fast. Cantina shipments let you spend “orange balls” on Tier I and Tier II ability materials. Never do this! They are easy to get and useless without the Tier III materials very quickly, as mentioned above. To give you an idea, I currently have 652 Tier I and 324 Tier II materials, most of which are useless because I only have 35 Tier III. There are many great characters in Cantina shipments, use your tokens on those. But there are two serious issues with chromium cards. First, they are random. People who have good luck with these packs race to the forums with excitement and tell everyone what great stuff they got. But you are just as likely to get shards for Royal Guard and Ugnaught as you are for Old Ben or Count Dooku. Probably more likely, in fact, because there are fewer great characters than mediocre or bad ones. It is entirely possible that you spend $20 and get junk. It is entirely possible that you spend another $20 and AGAIN get junk. You must remember this and be prepared for it. Chromium packs are gambling. They are designed to appeal to those who like to gamble, and even to those who do so impulsively. Second, the chromium-only characters can be unlocked quickly and easily, but can only be leveled up by getting more shards from chromium packs. So you might get lucky on your first pack and unlock, say, Princess Leia. But she starts at 2 stars. If you want her any higher, you need to keep buying packs. Some characters, like Vader or Barriss Offee, are viable at 4 stars. But most are not when competing against farmed characters that are 6 or 7 stars. The really big spenders (“whales”) get around this problem easily: they just buy TONS of packs. There are people who have bought so many packs they not only have gotten all (or nearly all) of the characters to 7 stars, they have over 1,000 extra shards on top for some of them! But doing this requires spending literally thousands of dollars. If you are willing to do that, great. But if you only spend, say, $100 or $200 on packs, what is most likely to happen is that you will end up with a bunch of shards for characters you don’t want, a couple of characters you like but can’t farm, and shards for characters you could have gotten in a few days by farming. And then you will feel frustrated. The bottom line is this: if you are going to go the chromium route, be prepared to go “all in” by spending at least $1,000, and possibly double that. If you aren’t willing to spend this much, do not buy chromium packs. You don’t need them — I have never purchased one and I do fine. You’re better off using any small amounts of spending on bundles or crystals for energy recharges. The forums are filled with people lamenting that they spent $100, $200 or more and ended up with nothing useful. In the days before writing this guide I’ve seen more than one person say they spent $500 or more and didn’t end up with what they considered a viable team. Don’t become a statistic. Wait at least 3 days, preferably a week, before you buy anything in the game. For some people the excitement wears off quickly. There are people I know who spent north of $1,000 on this game in the first week and I haven’t seen them since. As you level up you will be offered a variety of character bundles. If you’ve decided not to spend on the game, then ignore them. If you do want to spend on the game, many of these are an excellent value and should be considered. They are also time-limited and so far, CG has not said they plan to rotate them back for established players. Besides, they are most useful when you are new. Dark side pack: Practically free and a no-brainer, even if you don’t get Dooku. Heroine pack: IMO this is worth it for Barriss alone, who is an immense help in the early levels and even at end game in Galactic War. Asajj is also a fun character, though currently bugged. The other two are currently a bit underpowered, but this may change. Droid pack: An excellent value for a team that is very viable for low-spenders even at end game. I wish I had bought this one. Jedi pack: This is a weak value right now because Mace Windu is severely underpowered. That could change, and should because he is an iconic character. But it might not. It’s a gamble if you try this one. The Jedi Knight Guardian is humdrum; the Consular is very good, but easily farmed, though 70 shards gives you a nice head start. Force Awakens pack: This one I would skip unless you plan to spend a lot. Everything in there can be farmed, some of it quite quickly, and it is expensive. Others will disagree with this, but if you apply those crystals to Cantina refreshes you can get Kylo very quickly. If you want Kylo and Poe immediately, then buy this pack. The best deals on crystals are the larger packs. If you plan to stay for the long haul, and you want to buy crystals to accelerate gameplay, you’re better off spending $99 once and using the crystals over time than buying lots of smaller packs. Of course some people don’t have the discipline to do this and will just spend them faster. Do what makes sense for you. If you only want to spend a small amount, get the 21-day crystal subscription. It is the best value, and because things increase in price when you do them too often the same day, having them spread out isn’t a bad thing. It will also prevent you from overspending. 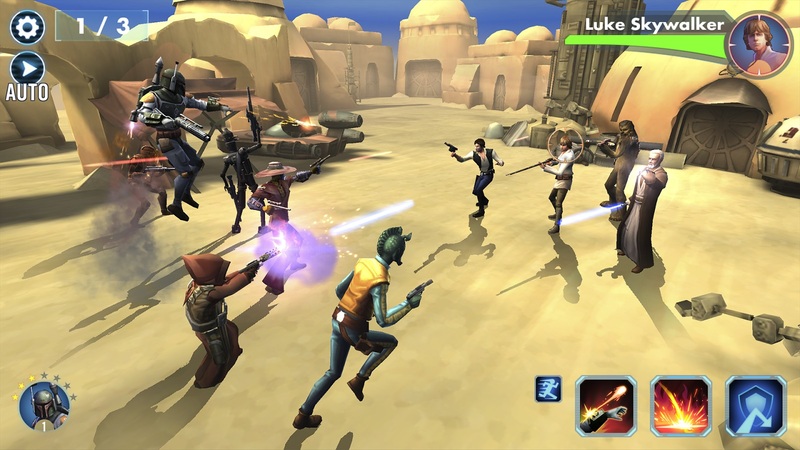 There are various “shipments” in the game: Cantina, Squad Arena and Galactic War shipments for character shards, and “regular” ones accessed through the “Shipments” icon on the main menu. Every 6 hours a selection of gear will appear here. Buy everything. This will help you towards achievements, and help you gear up characters. It does cost credits, but a tiny amount in the grand scheme of things (it costs 1,000,000 credits to promote a character from 6* to 7*, after a couple of weeks you aren’t going to care that you spent 2,300 on a shipment). The only exception would be for low-level items you already know you have a lot of. Always buy higher-level ones, you will be glad later on. Every day you have two challenges you can do, except Sunday when all six are available. Do all of them: they give valuable rewards and are quick and relatively easy, except at the start. Ask on the forums for help if you need it. You will get a few starter characters free, some of which you will only end up using for a few levels. Invest resources into them slowly over time, as you find them necessary to complete content. I don’t remember what characters everyone starts with. I do know that Jedi Consular and Chewbacca see use for a long time, and I think IG-86 is a starter also, and is very good (but easy to farm). Characters such as Royal Guard, Clone Sergeant and Ewok Scout are, at least for now, underpowered, and rarely seen above level 40. Strengthening characters requires raising their level (which requires training droids and credits), gearing them up (which requires equipment and a few credits) and increasing their star rating (which requires shards and credits). You also have to increase their abilities, though this is independent of level and star rating. Maxing out a new character is a major investment, even for an established player. Make sure not to work on too many at once, or you will perpetually be behind the power curve, and frustrated as you are always low on credits and droids. Use the sites I linked above and thoroughly research characters before investing in them. I wasted hundreds of shards on characters early on because 1 or 2 people told me they were great, and it turned out either they were wrong, or the characters only were great because of other characters I didn’t have. The nature of this sort of game is that certain team build ideas get popular and then very popular and everyone starts chasing the “meta”, only to find two weeks later that it has changed. Avoid this if possible. Make a plan for a team you find fun and interesting and stick with it as much as possible. Try to hold some resources in reserve for when things change, but don’t alter your plan every week or you will drive yourself insane. Freemium games like this one are deliberately designed with “time gates” for two reasons. First, to slow you down so you don’t progress too quickly, get bored and leave. Second, to tempt you to spend money to bypass the time gates. They are psychologically designed to prey on your impatience. That’s why everything is limited in some way, but with the option of bypassing the limits by spending crystals. Some spending of crystals makes sense, like I mentioned before. But giving in to impatience too much can quickly cause you to rack up a big bill in this game. Even though it might seem like it takes “forever” to unlock new characters or gain levels, things actually move pretty quickly in this game. The more patient you are, the better value you will get for what you spend. We’ve all been there… it’s exciting at the start, you play a lot, you are constantly leveling, you get new goodies, and then the high wears off, the honeymoon ends, and it’s just not as fun any more. And some aspects of the game get frustrating, such as bad luck with farming shards or getting stuck in GW. Try not to let it get to you, take a break if you need to, and maybe come back to it later. The game is still young and there’s a lot more yet to be added to it. Do you have more ideas for this guide? 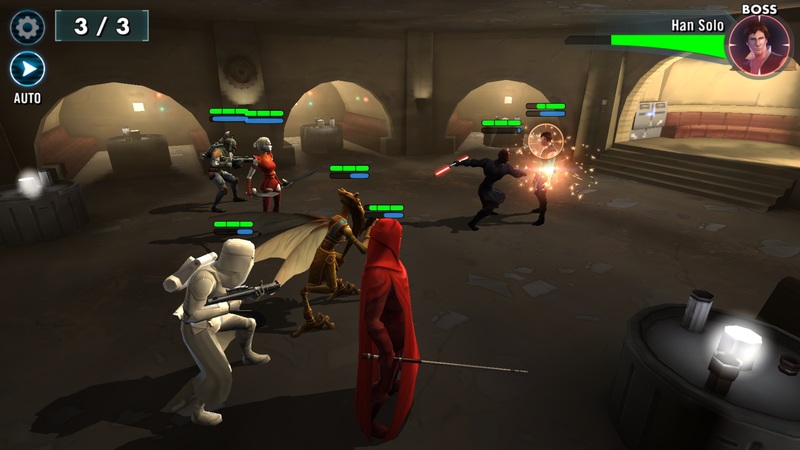 Please feel free to leave a comment below and we will frequently update this guide for Star Wars: Galaxy of Heroes. 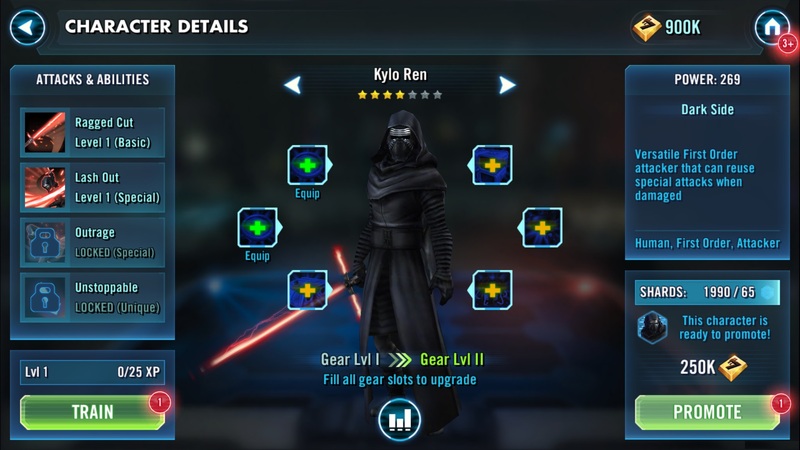 Be the first to comment on "General Guide – Star Wars: Galaxy of Heroes"